There are hop-on hop-off bus tours and then there's this one: cruise through Milan in style with this hop-on hop-off tour in a vintage street car. Get discounted admission to some of the city's best attractions and enjoy 24-hour free access to public transportation via the MilanoCard. On the tour, visit Milan Cathedral, known as Il Duomo, and then hop back on the tram to see the Sforza Castle and the Pinacoteca Ambrosiana, among other attractions. In the mood for shopping? Hop off at Quadrilatero della Moda shopping district and shop 'til you drop. Or just stay on the street car and enjoy the running on-board audio commentary. This is a great way to discover Milan! Not only are you traveling by vintage tram, but you are doing your bit for the environment, too. CO2 emissions are greatly reduced when sightseeing by tram instead of a coach! 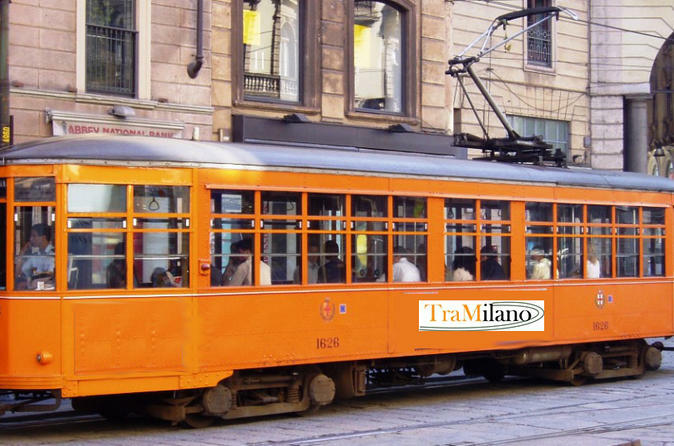 Hop on the vintage street car to begin this exciting day of exploring Milan. This city of 2.5 million people is a bustling and diverse metropolis boasting a thriving fashion scene, a cosmopolitan culture and ample amounts of history. Thanks to your MilanoCard, you can experience Milan at many different levels and many different ways. Hop off the tram at the Duomo, Milan's gorgeous Gothic cathedral. Spend some time lingering in the interior, gawking at the stained glass windows and sculptures of the saints. And don't miss heading up to the roof where you'll get an incredible view of the city. Back on the tram, consider hopping off at the Sforza Castle, a 15th-century fortress that is one of the largest of its kind in Europe. The castle houses some of Milan's finest art collections. When in Milan, one thing that cannot be ignored is fashion. So hop off the tram to wander around the Quadrilatero della Moda. Pop into shops of established and up-and-coming designers, chic boutiques and luxury shops. If you stay on the street car the entire time, the circuit takes one hour. Listen to the onboard commentary to get a sense of the history of the city and each place you pass by.